The Chicago Bears and Philadelphia Eagles unveiled unconventional coaching hires Wednesday, and in many ways their respective choices, Marc Trestman and Chip Kelly, are quite similar. Each man is an innovative offensive strategist with out-of-the-box overtones. 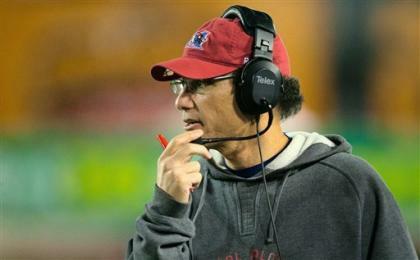 Trestman, who once quit the coaching profession to become a stockbroker, spent the last five seasons thriving north of the border in the Canadian Football League. 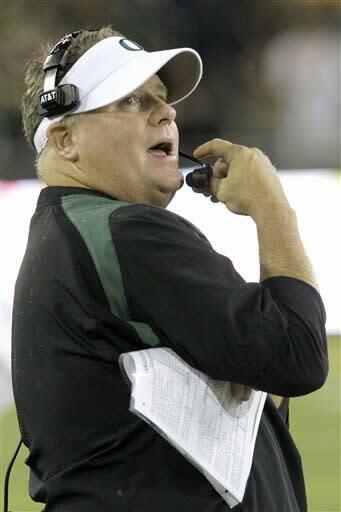 Kelly, meanwhile, has shaken up the college football world with his spread attack at Oregon. In that respect, in a vacuum, there is reason for the Trestman and Kelly hires to be celebrated. So many NFL franchises are unimaginative when it comes to choosing coaches that when two of them take chances on men who aren't among the usual suspects, it's refreshing. Yet a look at the larger landscape highlights a depressing overtone, one which I explored three weeks ago, when I documented the dearth of minorities in offensive play-caller roles. More than ever before, NFL teams are looking for offensive gurus as head coaches — and the pool from which they're choosing is almost exclusively white. So far, six of the NFL's eight head-coaching openings have been filled, and all six have gone to white men with primarily offensive backgrounds: Andy Reid (Chiefs), Doug Marrone (Bills), Rob Chudzinski (Browns), Mike McCoy (Chargers), Trestman and Kelly. And the reported favorites to land the two remaining jobs, Bruce Arians (Cardinals) and Greg Roman (Jaguars), also fit that description. In addition, five of the seven openings for general manager have been filled: All by white men. In an era in which American society seems to be getting increasingly progressive when it comes to social issues, from acceptance of gay marriage to the reelection of a black president, the NFL seems to be going backward. I used to write about this topic quite a bit, back in the days when the NFL's minority-coaching representation was downright shameful, and it bothers some people that I'm revisiting it now. Shockingly, the vast majority of these people who decry the fact that I'm "playing the race card" (as if the mere mention of race is a verboten ploy) are — wait for it — white people. Perhaps, to outsiders, the notion that many minority candidates have faced a tougher road to advancement than their white counterparts is unworthy of attention. But in my world, one in which whites are a minority among players, this is a legitimate topic of discussion among the rank-and-file and, especially, among African-American coaches and front-office executives who are frustrated with the current state of affairs. None of these men is an offensive coach, and that distinction certainly explains some of what's taking place. For example, Bengals defensive coordinator Mike Zimmer, who is white, also has good reason to be miffed by his inability to land a head-coaching job. Zimmer, perhaps the most successful NFL coordinator of the past several seasons, got beaten out in Cleveland by Chudzinski, who was criticized for his performance as the Panthers' offensive coordinator in Cam Newton's choppy second season. Meanwhile, Bengals offensive coordinator Jay Gruden — whose play-calling in the team's playoff defeat to the Texans was downright baffling — has been interviewed by three teams (and remains in contention for the Cardinals' job) despite the fact that he publicly stated he doesn't want to leave Cincinnati. For every Zimmer, however, there are many minorities who have even more trouble getting into the mix. Zimmer's good friend and fellow Bengals assistant, former Raiders coach Hue Jackson, has had zero head-coaching interviews (and only one interview for a vacant offensive-coordinator position, in Carolina) despite having presided over top-10 offenses in Oakland in 2010 and '11, and having gone 8-8 in his lone year as the Raiders' coach. Newly promoted Ravens offensive coordinator (and former Colts coach) Jim Caldwell, who like Smith has Super Bowl head coaching experience, hasn't gotten any sniffs, either. And as I detailed in my earlier column, there aren't many other minorities coming up the play-caller pipeline. For what it's worth, the current general-manager scorecard is equally imbalanced. White men have been hired for five jobs: Dave Caldwell (Jaguars), Steve Keim (Cardinals), Tom Telesco (Chargers), Dave Gettleman (Panthers) and John Dorsey (Chiefs). Former Chargers player personnel director Jimmy Raye, an African-American who'd been the presumed successor to A.J. Smith before the search began, ended up taking Telesco's old job (vice president of football operations) in Indianapolis after getting passed over by San Diego owner Dean Spanos. The two remaining GM openings, those of the Jets and Browns, are considered less desirable — Cleveland's, because of a presumed lack of front-office power associated with the position, and New York's, because of owner Woody Johnson's insistence on retaining coach Rex Ryan, along with a potentially meddlesome team president (Neil Glat) and unfavorable salary-cap and quarterback situations. On Sunday, Fox's Jay Glazer reported that the Jets "can't give the position away." Among those interviewed by the team were a pair of minority candidates: Giants director of college scouting Marc Ross, who pulled his name out of contention on Tuesday, and Steelers director of football and business administration Omar Khan. I'm not sure how badly Khan wants the job, but I'm fairly confident that if the Jets surveyed other potential minority candidates around the league, they'd probably find a lot of people who'd take the job quite enthusiastically. I'm even more sure they could "give the position away" to a qualified minority eager to run a front office. Meanwhile, an African-American, Chiefs director of pro personnel Ray Farmer, is reportedly the leading candidate to get the Browns' GM job. We'll see how that one shakes out, but for now, it's tough not to conclude that the current coach/GM hiring cycle has been a total whitewash. If I were a member of the Fritz Pollard Alliance, the organization charged with promoting equality of job opportunity in NFL coaching and front office staffs, I'd be embarrassed to show my face at the Super Bowl, NFL scouting combine or any other league event at which aspiring minority coaches and talent-evaluators are present. Right now, even with the Rooney Rule, the FPA's efforts have been about as effective as Packers defensive coordinator Dom Capers' gameplan against the 49ers and Colin Kaepernick last Saturday. Obviously, this is a significant problem that won't be solved by short-term solutions. If being an offensive guru is the pathway to becoming a highly desirable NFL head-coaching candidate, at least at the current time, then perhaps teams need to be prodded to expose more minorities to positions with play-calling potential. And if the Rooney Rule is no longer effective, as seems to be the case in both head-coaching and GM searches, we should think about ways to improve it so that minority-candidate interviews don't look like complete and utter shams. I know some of you don't want to be bothered with such inconvenient truths and would rather believe that every NFL owner (and/or individual with hiring power) is a color-blind, ultra-competitive beacon of nobility who is simply trying to find the best man for the job. If so, feel free not to read columns such as these — and to ignore the facts that suggest otherwise. Just know that in my world, the evidence isn't so easily dismissed, and a lot of very qualified and proficient men are baffled at the way the NFL seems to be regressing as we enter the early stages of the 21st century. I'm all for out-of-the-box hires like Trestman and Kelly, but if you look at the big picture, there's not a lot of imagination coming out of this hiring cycle — and there's not a lot of hope that it will change in the near future.